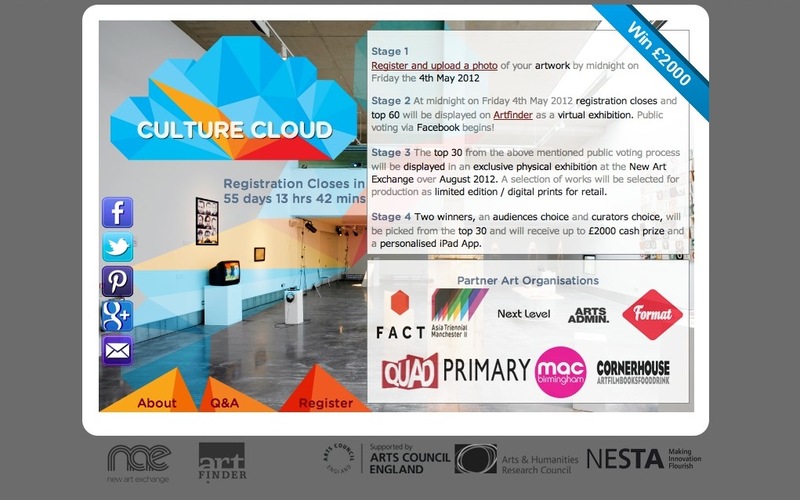 Culture Cloud » Archive » The Culture Cloud Goes Live! After artists register and upload images of their art to this site, each will be considered for shortlisting as one of 60 works to be selected by the Culture Cloud curators. Curators are drawn from a national network of partner galleries to New Art Exchange (NAE) and the project: FACT, Liverpool; Asian Triennial, Manchester; Next Level Projects, London; Arts Admin, London; Format Festival/ Derby QUAD; PRIMARY Nottingham; Midlands Arts Centre, Birmingham and Cornerhouse, Manchester. 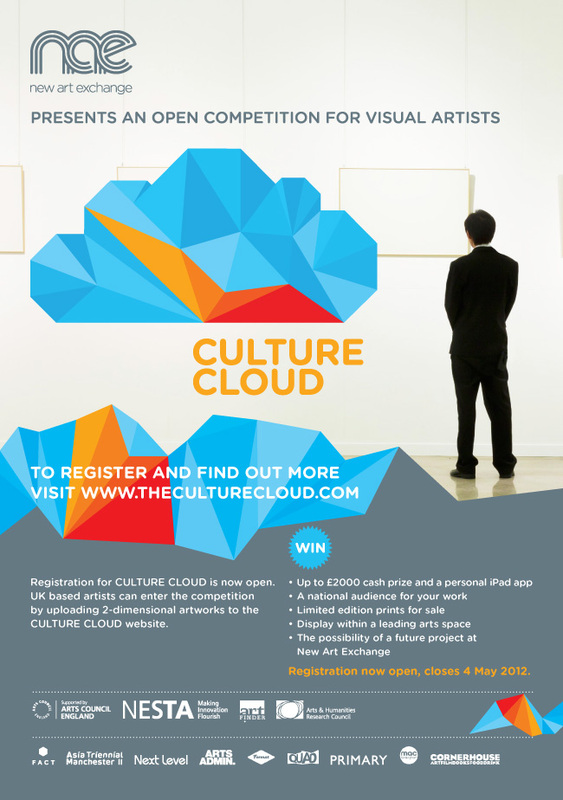 From 4 June – 5 July 2012, 60 works will be displayed on the Artfinder Culture Cloud website page which will be open to the public where individuals will be able to vote for their favourite work. Audiences will be able to log in register their preferences via a link to the Facebook ‘like’ function. Online voting will result in a further shortlist of the top 30 most popular works. After a Public Launch on 27 July this shortlisted work will be on public display at NAE from 28 July – 25 August 2012. There will be two overall Culture Cloud winners: a ‘curators choice’ and the ‘public choice’ based on votes from the final stage of the project. Each will each receive a cash prize of up to £2000, a personal iPad app and the possibility of a solo show and/or project at New Art Exchange in the future. The Culture Cloud site features an extensive Q&A for those interested in uploading, explanations of who is involved and an outline of what happens at each stage of the project. Queries about Culture Cloud can be directed to: culturecloud@nae.org.uk and of course, we invite comment on the project at this site as part of our evaluation.